“Don’t worry, you got this,” was what my friend told me on the morning of November 29th. 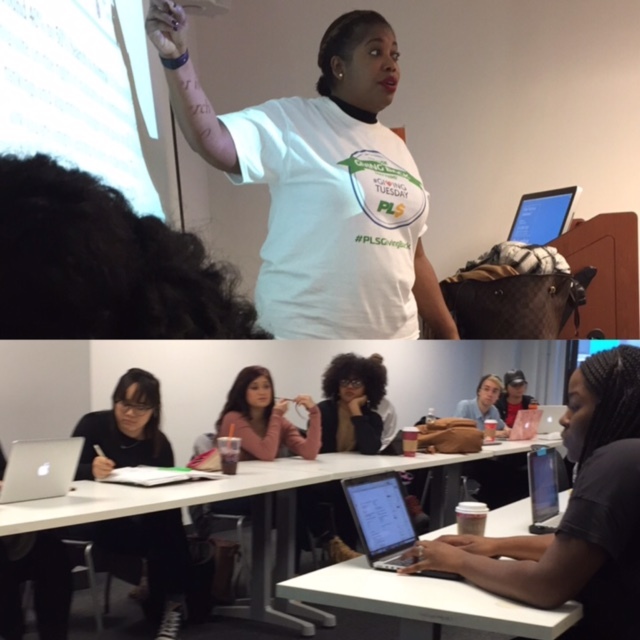 I was asked to assist the Executive Vice President of FCG, Christina Steed, in a social media marketing presentation for Shannelle Armstrong-Fowler’s class of public relations students at Columbia College. It was such an honor to even be considered. Just two years ago, I’d been in their shoes at the University Of Missouri- Columbia School Of Journalism – eager to learn what it was like in the real world of PR and communications from recent grads like me. My love for storytelling has always taken a front seat in my educational and professional experiences. However, I like to see my efforts come to life from behind the scenes. Suffice to say, I get a little anxious when it comes time for the spotlight to shine on me. But let’s face it, public speaking is a part of the PR job description – at least to some extent. So despite the nerves, I took the opportunity as a personal challenge. It was a chance to cultivate one of my professional growth goals – and I landed on my feet! – Why is social media marketing important? One fundamental reason is that it creates a two-way conversation between brands and their consumers. – What key elements make up a social media marketing campaign? – What are some daily considerations of a social media marketer? Equally notable, I must acknowledge how important it is for multicultural students to see and hear from professionals who look like them and who are doing what they want to do. There’s nothing more motivating than being able to actualize my dreams through the inspiration of those who I can really relate to. In the end, the presentation was a success in many ways. It was a helpful glimpse into the real world of social media marketing for a group of intelligent and eager students. It was an opportunity for me to sharpen my tools and learn in the process. And it was an opportunity for me to prove to myself that public speaking may not be my favorite, but I can do it!